09: Back to the future or fast forward to a new normal? News is neither a fixed nor a finite entity. There are some periods in history when it feels like there’s just more happening than at others. I’m not talking about the Dark Ages (which suffered a blackout from not just newscasters but also historiographers). I’m talking about periods in one’s life in the early 21st century when it feels as if there’s more going on globally and geopolitically than at others. Now of course, the growth of social media, driven by the democratisation of mobile technology and the explosion in smartphones in particular, has had a profound impact on the way that news is gathered, shared, and amplified. Today, anyone with a smartphone and a decent 4G or WiFi connection, can become a citizen journalist, blogger, or vlogger. But the mere presence and widespread availability of technology and means of data transmission cannot – in and of themselves – create more news. 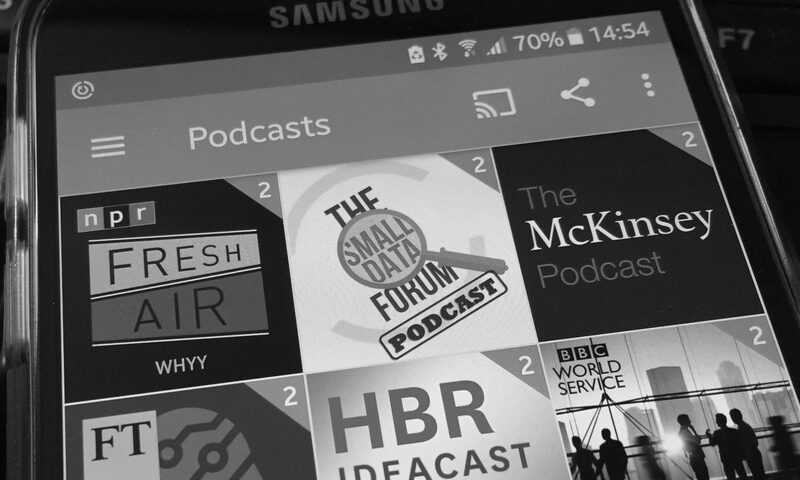 In the 13 months that the #SmallDataForum podcast has graced iTunes, it feels like we’ve been living through a period of Big News, and Big News powered by Big Data to boot. The EU Referendum and Trump’s victory in the U.S. Presidential Election rocked the world off its data-driven axis last year, and the polling and analytics industry went into meltdown over their collective inability to predict anything with certainty. We’ve picked over the entrails of those two votes in forensic detail in recent podcasts – the causes and effects, the role of microtargeting on social media platforms, the spectre of emergent powerbases such as Cambridge Analytica. Things then seemed to get back to “normal”, with the rejection of extremists in the Netherlands, the triumph of reason in France with the emergence and victory of political ingénue Macron. And just when we seemed to be moving back to a world of predictable rationality, we came over all Dan Ariely again; Theresa Maybot’s vainglorious gamble to secure a landslide victory for “secure and stable” leadership of Brexit blew up in her face and ended in hubris and humiliation. Yes – as the spin doctors programmed into her circuits – the ruling Conservative Party won the most seats and the most votes. But to squander a 20-point poll lead against an apparently unelectable disaster area in the shape of Jeremy Corbyn was, to mimic Oscar Wilde, careless. Until, of course, the voters actually met and experienced him, unmediated. In the latest episode of the #SmallDataForum podcast, my regular collaborators Thomas Stoeckle, Neville Hobson, and I subject the latest piece of Big News to our usual scrutiny. There’s lively debate about old vs new media, with the right-wing traditional media (particularly the press) apparently little more than an echo chamber of vitriol, as well as the fleet-footed use of social channels and influencers to target younger voters. The very younger voters who were largely ignored in 2016’s two seismic polls and whom traditional media finds harder and harder to touch. The cumulative effect of Big News, on individuals and societies, can feel overwhelming and isolating to citizens and communities. While the unnecessary, uncalled-for, and often-denied U.K. general election feels to some like a trip back to the future, to others it establishes the new normal of predictable irrationality. But whatever your reaction, and whatever your conclusion, you’ll find interesting food for thought in the latest episode of the #SmallDataForum podcast. What’s more, as we approach – like Raphael Nadal – La Decima, me and my fellow podcasters are starting to take on (or perhaps express) our true characters. I’ll let Thomas and Neville define their own personae, though to me they’re sounding more and more like the philosopher-peacemaker and the sage. As for me, you’ll find me filed under Mr Grumpy-Ranty Classicist.